For 37 years, the deft hand of Janice Feldman, president and CEO of JANUS et Cie, has made an undeniable mark on the residential, contract, and hospitality furniture market—both indoors and out. When it comes to durable outdoor furniture made of innovative materials, her firm is undeniably an industry leader. In a bold move last year, Feldman moved to the site of her company’s latest in global expansion: Singapore. Interior Design sat down with the trained artist and interior designer to learn what it’s like to work in an island country with an average temperature of 81 degrees Fahrenheit, where the city’s hottest design and culinary spots are, and what the future holds for JANUS et Cie.
What’s your take on living in Singapore, from the perspective of someone in the design industry, and how is business different? Janice Feldman: Singapore is very efficient. Setting up our international branch in Singapore took less than six months! In that time frame, we set up the business, selected a location, completed construction, and moved in. In terms of business there, the design industry is less consolidated, as there is no design center. Plus, the owners of corporate and hospitality properties are far more involved in the decision-making process. I believe this is likely because the designer furnishings industry is somewhat younger in Asia. We are one of the first American furniture companies to establish our international headquarters in Singapore, which has been incredibly well-received by both our Asia-based clients and our American clients who are specifying projects in Asia. Most other companies have historically operated through retailers and dealers. Clients appreciate that we have invested in understanding their opportunities and challenges, and servicing their needs through the lens of a local perspective. What specific needs does the Singapore market have? What niche can the company fill? The average home size is smaller in Singapore than in the U.S., so people tend to buy smaller-scaled products. We offer many seating and dining elements to satisfy this need and are also developing smaller sizes of current and new products. For the most part, the Singapore design aesthetic is in the spectrum of contemporary to modern, and, due to the heat and humidity, upholstered furniture is not a desired look indoors. Our exterior products, that don’t need cushions, are great options for homes with active lifestyles and children and pets. Clients are especially finding our interior rattan products of interest. Rattan is a very popular material in Asia with a longstanding heritage. Singaporeans appreciate the craftsmanship and days of handweaving it takes to create these pieces. Especially popular collections in Singapore are See! and Suki Interior. There has been a lot of excitement locally for our textiles and accessories. Many of the showroom’s first-time guests immediately fall in love with the tabletop accessories, especially once they discover how reasonable some of the prices are! How is your lifestyle different in Singapore? I don’t drive a car in Singapore. I go everywhere by taxi or public transportation. If I need to run errands, I batch them together so I can take one cab. It’s a very efficient way to get things done and the drivers are happy to oblige. I don’t think this type of kind, amenable taxi customer service would ever happen in New York! This fantastic customer service is consistent everywhere in Singapore. Everything is located in high-rise, multi-use buildings, so groceries, restaurants, shopping, and the pharmacy are nearby and convenient. Cost of living is very expensive, as everything is imported. It’s been an adventure to find the best places to buy different types of food and supplies. Finding organic food can be a challenge—unlike in the States. Singapore is extremely international and there are people from all over the world in this concentrated area. I find this culturally and intellectually stimulating. I’ve made many new friends of all nationalities and enjoy learning about and spending time with them, and finding our commonalities. Unlike the U.S., Asia is not pet-centric. We brought my dog, Jami Moon, with us and it’s interesting how people respond to her. She’s extremely people-friendly, but a lot of people are hesitant to meet her. What cool design spots have you found so far in the city? The Red Dot Design Museum is one of two locations in the world and it definitely fuels my appetite for design. Another option is the Bras Basah.Bugis District—this is where the iconic Raffles Hotel is located and there is lots of historic architecture intermixed with modern, new high-rise buildings. There are many interesting design and furniture stores including our own showroom. I enjoy walking this area and seeing the new storefronts opening their doors. There is a lot of energy being infused here between the European feel of the area and the new construction of beautifully designed commercial complexes. Food seems to be the national pastime of Singapore. There are a lot of great places to eat and be in a nice environment. Restaurant André is an amazing culinary design experience. I also enjoy the Maxwell Road Hawker Centre, which abounds with authentic, inexpensive, culturally diverse street food in an open-air, covered environment. Each visit is a culinary adventure! 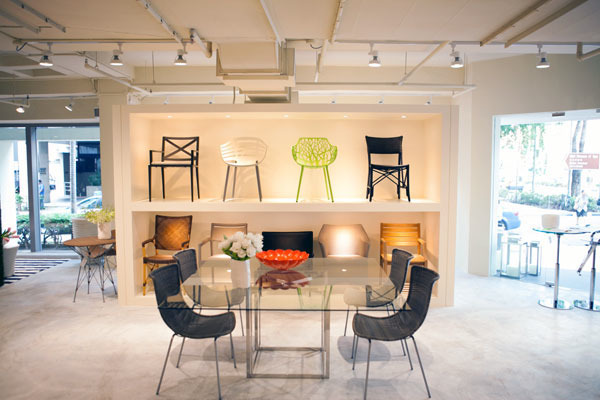 janusetcieSingaporeShowroom 15JANUS et Cie in Singapore. Photo courtesy of JANUS et Cie.
How would you describe JANUS et Cie’s international business and global reach and what are your plans for the future? Our international business has expanded to even the most remote of locations. We recently delivered to an island so remote it didn’t have UPS, DHL, or FedEx service! JANUS et Cie offers 12 international sales offices in 10 countries. Our sales professionals are on the ground, understand how to do business in their region and speak the language. We understand projects have specific needs based on location and country and we collaborate with specifiers and purchasers to address their business objectives from day one. Flexible logistics solutions address the different needs of projects and installations. Production in 14 countries and stocked Quick Ship programs in the U.S. and abroad enable Janus et Cie to save time and money for clients. Client services support staff in different regions around the world enable Janus et Cie to support our designers and their clients regardless of their location or their concerns. 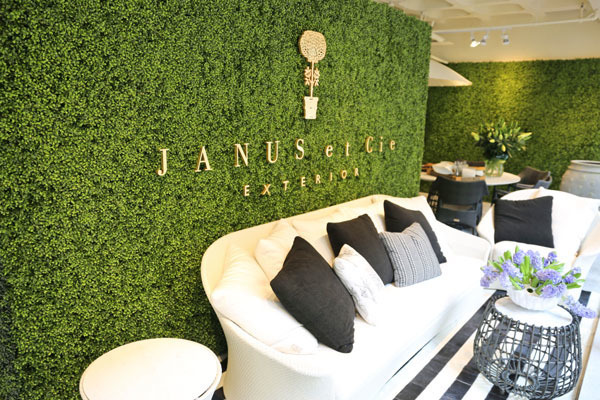 Janus et Cie has a vastly diverse product offering in terms of style, material, and price, which allows us to support all types of projects in the residential, contract, and hospitality sectors. We’ve always listened to our clients, whether it’s specific needs or general feedback and use those conversations as a foundation for creating new products and providing excellent service. We’ll continue to do this as we expand our international footprint. In terms of the future, this year we are launching several new collections including the Masters Aluminum Series, in collaboration with Orlando Diaz-Azcuy. I’ve long admired his talent and am honored to be working with him to bring these designs to life. I’m looking forward to continuing our efforts together as well as creating new partnerships with amazing designers from our community. We will continue to develop innovative products, find the best locations, and hire wonderful people globally for our ever-expanding international clientele.